We are more than a training center. We are an institute serving the Greensboro, NC area, covering all your response training and safety product needs. We offer both traditional and e-learning options, with consultants available around the clock to get you into the program or class that you need. In addition to CPR certifications, we also offer BLS Certifications, PALS certifications, and AED Certifications. Our classes are short, fun, and personalized. The consultants personally monitor the progress of each student to ensure a low-stress, hands-on experience. So if you are looking for CPR, BLS, PALS, or AED Certifications near Greensboro, NC you’ve come to the right place. At the Response Institute, we offer a wide range of CPR certifications to meet your needs. 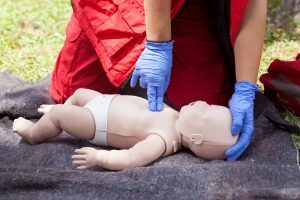 We have classes that include a trifecta of adult CPR, child CPR, and infant CPR. Whether you are looking for a CPR certification online or need in classes guidance the CPR Consultants will be happy to help. Our American Heart Association CPR classes teach critical skills needed to respond to and manage a choking or sudden cardiac arrest emergency. Online classes are self-directed and ideal for those with limited or no medical training. Online classes are 3 part courses that include interactive lessons and videos to facilitate learning. These classes are for the lay rescuer, not the healthcare provider. Please see the BLS for Healthcare Provider classes if you are in or plan to be in the medical or dental field. Upon completion of these courses, students receive an American Heart Association Heartsaver CPR AED First Aid Completion Card valid for two years from the date of the course. If you are interested in a CPR certification renewal or signing up for a class, click below to check out our availability in the Greensboro area. The Response Institute’s classroom BLS course teaches both single-rescuer and team basic life support skills in both prehospital and in-facility environments. The instructor-led course lets students participate in simulated clinical scenarios with a focus on high-quality CRP and team dynamics. Students will work with an AHA BLS Instructor to complete BLS skills practice and skills testing in order to prepare them for the written exam. Part 1 of The American Heart Association’s BLS Certification is readily available 24 hours a day. The BLS online course provides a flexible alternative to classroom training and is facilitated through case-based scenarios as well as interactive activities. Part 1 must be completed online prior to Part 2 and 3 (skills evaluation and testing). Part 2 and 3 consists of hands-on evaluation with an AHA authorized BLS HCP Instructor. Upon successful completion, students receive an AHA BLS HCP Course Completion Card valid for two years. Whether this is your first time taking the AHA BLS certification course or you are interested in an AHA BLS renewal we have you covered. Click below to see our course availability in the Greensboro area. WIth a PALS Certification from the Response Institute, healthcare professionals will have the skills to better recognize and treat critically ill infants and children. The course uses an interactive scenario-based team approach to teach pediatric emergency management. 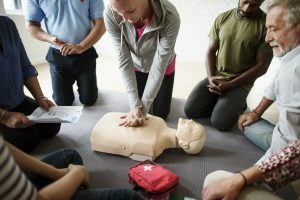 The American Heart Association PALS course offered through the Response Institute covers treatment beyond the first few minutes of an emergency. Interactive scenarios take students through stabilizing patients in transport phases of pediatric emergencies, both in and out of the hospital environment. If you are interested in obtaining a PALS certification or renewing a current PALS Certification in the Greensboro, NC area we have the classes you need. In addition to offering classes at our training center, we also offer on-location training. With a group of at least six individuals, we will be happy to come to your facility to perform a training or teach a class. So if you are in need of on-site training contact us to schedule an appointment.